While we try to mix things up a bit from week to week, it's been over a month since we presented an episode of X Minus One, acknowledged as the greatest pure SF radio show of all time. It's been even longer since we ran one from Ray Bradbury (1920- ), his previous two being "And the Moon Be Still as Bright" and "Kaleidoscope." "Kaleidoscope" is one of the stories told in The Illustrated Man (1951), while "And the Moon Be Still as Bright" is one of the future history stories comprising The Martian Chronicles (1950, original 1st edition cover at right). 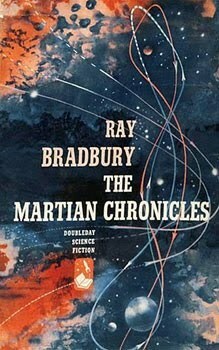 This week's Bradbury tale, "Dwellers in Silence," is also taken from The Martian Chronicles. Originally published in Maclean's magazine on September 15, 1948, its original title was "The Long Years" (which in the book is given as "The Long Years: 2026"), as by one Roy Bradbury. "Dwellers in Silence" takes place near the end of the future history, when Mars is in crumbling ruins and Man has traveled outward to the remaining planets of the solar system. After some 20 years a ship arrives from one of the outer planets to revisit Mars to see if anyone might still be alive. What the three astronauts find forms the crux of this bitter-sweet tale. The story was first adapted for radio by George Lefferts for Dimension X (April 1950-September 1951), the forerunner to X Minus One (April 1955-January 1958). "Dwellers" aired on Dimension X on July 19, 1951, and then again on X Minus One on November 10, 1955 (also scripted by Lefferts). It is not unusual for reasonable liberties to be taken when adapting a written work to a mere half hour radio drama, as long as the heart, the original intent, of the story be maintained. Such is the case with "Dwellers." Bradbury's original story has the astronauts--as noted above--returning from the outer planets to visit Mars. Lefferts has the astronauts originating from Mars and visiting what they imagine to be a ruined Earth 20 years after the Great War (via an atomic holocaust; remember this was adapted in the 1950s at the height of the Cold War). Aside from this switch, there are no major differences from the original story. However, it is interesting to hear both the original Dimension X version alongside the redone X Minus One version. The musical scores are markedly different, with the Dimension X score being more eerie (and perhaps more melodramatic), and the X Minus One score softer, and classier, if you will. Both are effective in their own right. The other notable difference is in the scripts themselves, for Lefferts has tightened his original effort, providing a slimmed down, cleaner tale the second time around. Rather than choose one or the other of the adaptations, we present them both. You can decide which you prefer. The photo of Bradbury (above) was taken by yours truly when at Archon 20, St. Louis, MO, the weekend of October 4-6, 1996. Bradbury was Guest of Honor. Also in attendance for this landmark convention were Bradbury's lifelong friends Ray Harryhausen (Artist Guest of Honor), Forrest J Ackerman (Fan Guest of Honor), and Toastmaster Julius Schwartz. It was quite the historic event, believe me (especially so since October 4th was my birthday, and while I had met Julie and 4E before, it was quite the birthday gift to meet both Ray's for the first time). Listen now to both adaptations of Ray Bradbury's warm and very human tale of the "Dwellers in Silence."